The "Net Promoter Score" question is a question type that is geared toward trying to determine customer loyalty and the health of customer relationships. A good "Net Promoter Score" has also been shown to correlated to revenue growth, so in that sense it serves as a window into an organization's overall health and likelihood to grow. Wow! Your Net Promoter Score uses a scale of -100 to 100. Here is a breakdown of how results are scored. Here's an example of how the report of the results look inside our reports. The Net Promoter Score is different than many of our other question types in that both the question text ( for the most part, see below) and answer options are already created for you. Here's a view of question the survey taker sees. "How likely is it that you would recommend [brand/product/service] to a friend or colleague?" This is what shows up in your question text when creating the question. All you need to do is substitute your brand, service or product name in the question text for the text "[brand/product/service]". To keep the integrity of the question, it is important refrain from changing anything else about the question text. The answer to this question is a scale from 1 to 10 shown in boxes. This part of the question we create for you and it doesn't show on the question create screen. There is nothing for you to do or modify in the answer options. 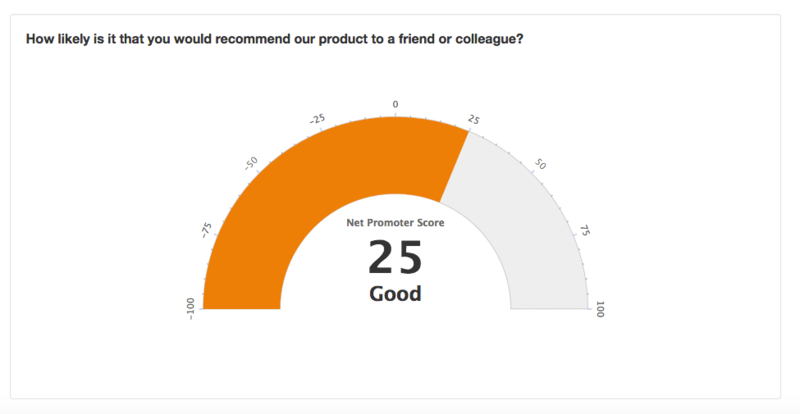 Your Net Promoter Score has a relatively easy calculation that we do for you behind the scenes and show you the result. But how exactly do we arrive at the number? Well, to explain the calculation for we must explain how the answers are viewed. According to the Net Promoter Score framework, any person that answered 0 to 6 is considered a detractor. They are not thrilled with the service and will be unlikely to purchase again. Any respondent that answered 7 or 8 are considered "Passives". They like your product or brand just fine, but are not immune from switching to a competitor. They won't probably spread the word about your product to their friends, but it is fitting their needs for now. Any respondent that answers 9 or 10 are considered "Promoters". They love your company and are likely to buy from your company again and or recommend you to colleagues. "Promoters" tend to make multiple purchases, stay longer as customers and bring in new revenue through recommendations. The actual calculation of the score is your percent (%) of Promoters minus your percent (%) of Detractors. That's it. So let's do a sample. Let's say you had 20 respondents,and the way their responses ended up was as follows. So the resulting Net Promoter Score would be of the above would be 15. That is 35% (the percent of the Promoters) - 25% (the percent of Detractors). With the Net Promoter Score question type, we give you an interface quickly create a Net Promoter question that is geared toward measuring customer loyalty and in doing so is a proxy for future revenue growth and company health. The score is unlike many of our other questions because we create the question text and answer options for you and we calculate the score for you once the answers are received. Use the Net Promoter Score question as a tool to judge you company health.